Quick card stamping Penny Black Poppy Gems with gold Encore ink and a black sentiment from Hero Arts Color Layering For You Flowers. Inspired by this gorgeous card from Aga. Cardstock is white linen from Ellen Hutson. Envelope from Paper Source. MOOD WHEN DONE = Having a good day! Hope you are as well. so CAS and classy - gold envelope = perfect! This is such an elegant card Joan!! The black sentiment on its small raised oval looks so handsome with the gold outline flowers. Really a nice card! Yum to the gold...gorgeous design. I just bought this stamp and am looking forward to coloring it someday. So beautiful in gold, especially with the gold envelope! Gorgeous! 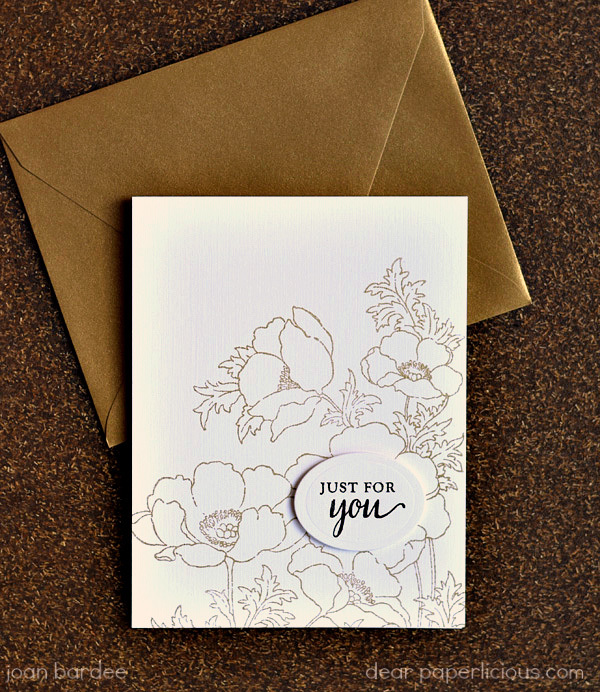 What a great, simple but beautiful card -- and that envelope! If you are looking for the best flowers, this is definitely the only place you want to go to. This is the best Flower Delivery Los Angeles shop I had never been to before. I brought three blue bouquet of flowers and they were absolutely gorgeous.